Rich Rodriguez isn't happy about all the late night road games on Arizona's Pac-12 schedule. Arizona’s football team returned to Tucson from Saturday night’s sloppy but rewarding victory over Colorado at about 3 a.m. Sunday. Sunday afternoon brought a rigorous film session to review what needs to be cleaned up, and Monday was a day of rest and academics for the players before they resume preparations for Saturday’s homecoming game vs. Washington State on Tuesday. 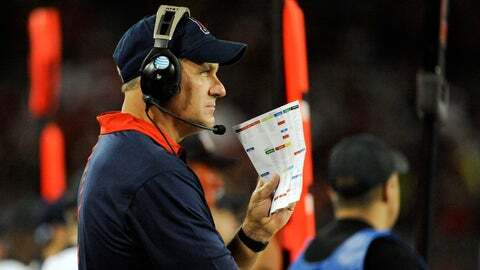 For head coach Rich Rodriguez, however, Monday was a day to climb on his soapbox. A couple hours prior to Rodriguez’s weekly press conference, the Pac-12 Conference and its affiliated television networks announced the schedule of games for Oct. 31. Arizona’s game at Washington was scheduled for an 8 p.m. kickoff on FOX Sports 1. Given the flight back from Seattle — and the change from Daylight to Standard time while the team is flying back — figure on the Wildcats landing in Tucson at roughly 5 a.m. Sunday. And then the Wildcats — who are scheduled for 12 consecutive games without a bye — head back on the road the following week to play at USC. For Rodriguez, it’s a sore spot that’s getting sorer. He pointed out to an injury list with 22 guys on it, and said the schedule is not conducive to recovery. "Let me get on my soapbox here," Rodriguez said. "I just found out that the next game is going to be at Washington at 8 o’clock at night, so we’ll get back at 5 o’clock in the morning. "I just don’t understand how this happens where you play 12 straight and you play night road games and we’re going to play an 8 o’clock road game at Washington, get back at 5 in the morning and have to go back on the road again. "If the conference is really concerned about student-athlete welfare, I think someone should step in. Because when do guys get a chance to get healthy? You’re not getting treatments on the plane; you can try to sleep, but you’re not getting a whole lot of rest when you’re traveling. It’s just ridiculous in my opinion." Rodriguez circled back to the topic later in the session in an even more animated manner. "I understand TV’s going to pick the times and they have the right to do it," he said. "They’re paying us all this money, so they’re going to pick the games, but every road game almost seems like it’s a late night. And you’re getting back and you have no open dates and you got to turn around and go back on the road again. "There’s got to be a better way. At some point the conference has to have a little bit of ability to step in and say hey, give this team one afternoon road game. Maybe all the rest of them are night, but give ’em one break so they get home at a reasonable hour. "The late night road gtames combined with no open date, is a little bit of not being cognizant of what the student athlete is going through. Rodriguez said it would be far more preferable to play on Thursday or Friday night — and made a point to note that Arizona hasn’t hosted a Thursday night Pac-12 home game in his four years on the job. "There’s got to be a time after the game for them (the players) to catch your breath. Kind of just get a day so you don’t have to think about football all the time. "I’ve been waiting four years. We haven’t had one, have we?" When not discussing scheduling, Rodriguez was asked about the decision to pull starting quarterback Anu Solomon in favor of Jerrard Randall, who sparked the come-from-behind victory over Colorado, and where his quarterbacks stood going into this week. "Who knows, he might start," Rodriguez said of Randall. "Maybe. If I knew, why would I tell anybody? Like I told the team, it’s no different than any other positon. It’s always been that way. Everybody competes every day. "It’s like you have a starting pitcher. Maybe his location’s off, he not hitting all the spots he wants to, so you bring in a relief guy. We brought in a relief pitcher and he threw a couple of fastballs right down the middle. So it was good. "Anu’s a good player, he didn’t hang his head. They’ll compete all week in practice. I feel that we have two guys at quarterback I have complete confidence in. I have complete confidence in Anu Solomon and Jerrard Randall." Randall adds a running dimension to the offense that Solomon hasn’t shown, but Rodriguez insisted that he’s capable. "Anu’s a better runner than even he believes. He’s an athletic guy, he can run," Rodriguez said. "It’s just a process of learning. Anu can run well. We just have to convince him to have the confidence to do it."